When you have a book in print and friends and strangers read it, they usually recommend another book with a similar topic to you. For a year and a half we have made appearances in bookstores, community centers, high schools and libraries where we spoke about our novel Stumbling Stone, read passages from it, answered questions and sometimes heard inspiring stories from the audience about hidden children, partisans and survivors. We have read many of the books that were suggested and learned a lot of new details about the years of rising fascism in Germany from 1922 to its defeat in 1945. 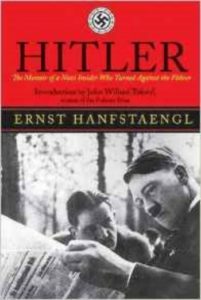 Two books I have read left a lasting impression: Ernst Hanfstaengel’s memoir with the simple title Hitler gave me a first person insight into the small group of Nazi insiders and how they formed a movement that engulfed Europe. Hanfstaengel was a personal friend of and later foreign press coordinator for Adolf Hitler. 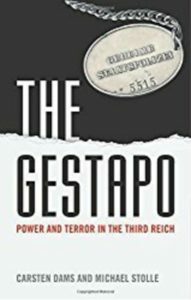 Carsten Dams and Michael Stolle’s The Gestapo was another fascinating read. From both books I learned how a parliamentary democracy with checks and balances was step-by-step perverted to a one-person dictatorship that systematically persecuted its critics. This would all make simply for a helpful and interesting look back, but since the inauguration of Donald Trump, I have become alarmed about the parallels I see. The Republicans have the presidency, the Supreme Court and both houses of Congress and yet the new president sidesteps our political system to govern by fiat, avoiding our system of checks and balances. One could argue that former President Obama likewise largely governed by executive orders. Was that not the same? What Trump is doing is not what Obama did. The Republicans blocked any presidential action, largely on ideological grounds but possibly because Obama was not Caucasian. The only way to accomplish the government’s work was through executive action. If you have the majority in all branches of government as Trump does and still govern by executive action, it raises the question of why. The approach could be viewed as preventing democracy from functioning as it was intended by the Constitution. Hitler early on abolished the German Reichstag (parliament) and governed by decree alone. He created the feared Gestapo from local police and other sources and used them to persecute those who opposed him. Maybe you can see where this might be going. Let’s hope the Constitution isn’t one of the regulations Trump is trying to get rid of. And let’s hope vigilant American people see a pattern – if there is one – and behave as Gerhard Schmidt, the character in Stumbling Stone, did. He resisted.